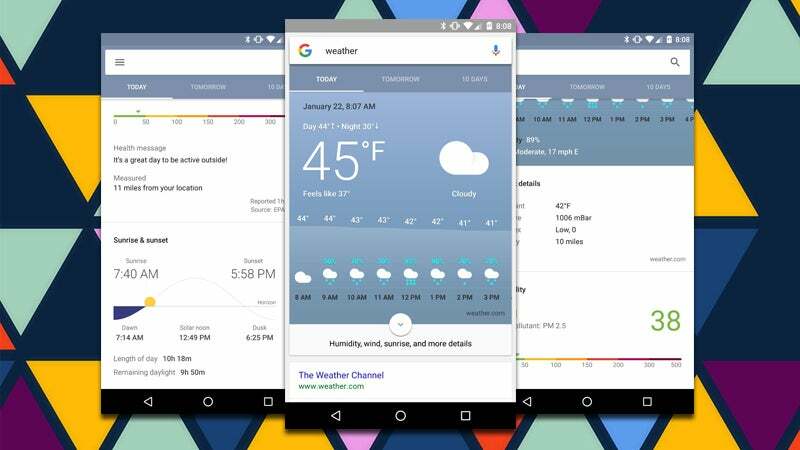 Android: Searching for "weather" on your phone has always been a quick way to find out how cold it is outside. Now, though, Google's added a wealth of new information to its updated weather card. When you first search for weather on your phone (Android only for now), you'll see the normal daily forecast with hourly breakdowns. You can tap to view tomorrow, or a 10-day forecast. The really interesting stuff, though, comes when you tap the little downward-facing arrow on today's forecast. Google can now provide you with information about the air quality outside (useful for anyone with sensitive respiratory problems), UV index, and even how much daylight you have left in the day. It's a crazy amount of information about the weather outside, all in a one word search. When they get their data from BOM I'll start looking at it. I was thinking the exact same thing. Their forecast seems to be consistently 2 to 4 degrees C off the BOM forecast which really makes you wonder how that figure was arrived at. It's nice too look at it, but the weather is so inaccurate. Agreed, it's too inaccurate without BOM data. The Oz Weather app Pocket weather uses BOM data, rain radars & can follow you where you travel. It's 6 day forecast has BOM accuracy because a 10 day non-BOM forecast means inaccuracy. And one critical feature missing from many weather apps are BOM state warnings. It also has "feels like' temperatures, UV, wind speed, wind gust, sunrise & sunset, tides for set locations, humidity, dew point and uses your phone's sensors for air pressure. In it's graphing feature, it plots wind speed and temperature by the minute. In the rain radar feature you can set different radar radii an time periods to look at rain history. The measure missing from the app above is air quality. The only thing missing from the app is reminding you to stick your head out the window to see what your local weather really is like! And my wall thermometer and car thermometer both match the BOM data (+/-1C) for my location, so can say it is accurate enough for my purposes.